Bianco Nuovo is our Saturday runner when he goes to Bendigo. The three-year-old son of Artie Schiller is race three, the Maiden Plate over 2400m where he will be ridden by Rhys McLeod and jump from barrier six. Bianco Nuovo has been placed at three of his four starts this preparation, only beaten 1 1/2-lengths at his last start over 2200m at Geelong by subsequent Sandown winner Mazzuro and Wolfe Tone, who reopposes on Saturday. While Mike Moroney feels Bianco Nuovo will be a better horse next preparation he is content to try him over the distance. “We’re really happy with him and the way he’s trained on and it will be interesting to see him stepping up in trip,” Moroney said. “I do like the horse and think he’ll be better next preparation but he’s fit and well so we thought we should test him at the distance. 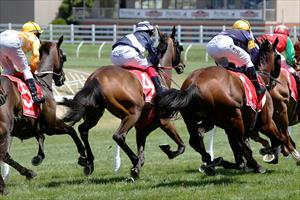 “There’s a bit of form in the race but I’m happy with our horse and his last start was good.